The International Association of Yoga Therapists ' 2013 Symposium on Yoga Research (SYR) is the West's only comprehensive and widely publicized academic research meeting devoted to yoga research. 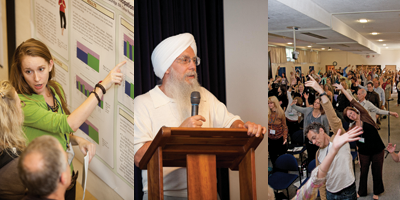 The first two SYR conferences at the Himalayan Institute in 2010 and at the Kripalu Center for Yoga and Health in 2011 attracted almost 200 and over 225 registrants, respectively. SYR 2013 is a single-track academic research meeting that will include keynote speakers, invited oral presentations from other senior researchers, multiple poster sessions and ample opportunities to interact with other scientists, experts and professionals in the field. The conference is also a unique learning opportunity for yoga therapists, clinicians, integrative healthcare professionals and psychology and education professionals interested in yoga research. Comprehensive Preconference Workshops fundamental to successful scientific writing and acquiring funding are also offered. The conference is structured so participants have many opportunities to interact with colleagues, share ideas and explore collaborations that may lead to future research projects. Herbert Benson, MD, Director Emeritus of the Benson-Henry Institute (BHI) and Professor of Medicine, Harvard Medical School. Beth Bock, PhD, Professor of Psychiatry & Human Behavior, Alpert School of Medicine at Brown University. Richard P. Brown, MD, Associate Clinical Professor of Psychiatry at Columbia University. Debbie L Cohen, MD, Associate Professor of Medicine, University of Pennsylvania. Holger Cramer, PhD, Yoga Research Director at the Department of Internal and Integrative Medicine, University of Duisburg-Essen, Germany. Patricia L. Gerbarg, MD, Assistant Clinical Professor in Psychiatry at New York Medical College. Helen Lavretsky, MD, MS, Professor of Psychiatry and Biobehavioral Sciences. Director, Late-life Mood, Stress, and Wellness Research Program at UCLA. Crystal L. Park, PhD, Professor of Clinical Psychology at the University of Connecticut, Storrs, and affiliate of the University of Connecticut Center for Health, Intervention and Prevention. Susan Reed, MD, MPH, MS, Professor at the University of Washington in the Departments of Obstetrics and Gynecology and Epidemiology and is jointly appointed at Fred Hutchinson Cancer Research Center and Group Health Research Institute in Seattle. The scientific program committee is responsible for all aspects of programming for this research conference, including the selection of speakers, the preconference sessions and general guidance for the poster sessions. All reviewers on this committee review all abstracts, thereby providing three blind reviews for each abstract. New for SYR 2013 are two preconference workshops on fundamental skills for all researchers, scientific writing and acquiring funding. Demystifying Scientific Writing: Simple Techniques for Successful Manuscripts. Fundamentals of Acquiring Yoga Research Funding. Presenter: Partap S. Khalsa, DC, PhD, DABCO, Program Director at the National Center for Complementary and Alternative Medicine (NCCAM) and the Scientific Program Committee. SYR is a single-track conference; therefore all attendees will be together during all presentations. This format facilitates communication among colleagues as well as a sense of community. Each year a riveting and inspiring feature of SYR is the poster presentation sessions with representative researcher on hand to answer questions and discuss their research. SYR 2010 and 2011 were limited to 40 posters. This year we have room for more. SYR and SYTAR will be held back-to-back, June 11 - 13 and June 13 - 16 at the Boston Marriott Newton in Massachusetts. This is a cozy hotel, set in a quiet, suburban location on 22 acres of scenic riverfront land on the Charles River, 12 miles from the airport and convenient to I-90, I-95 and downtown Boston. Registration will open in January 2013. Follow us on Facebook and Twitter for important updates. The SYR 2013 conference team works closely together to make this conference a valuable and enjoyable experience for all attendees. They also welcome your ideas and suggestions for improvement.